Success by profitability and privatization of profits, the recipe of the World Bank in one of the biggest metropolitan areas of the world to ensure its vision on the "right to water"
Until 1997, water services in metropolitan Manila were ran by the public company Metropolitan Waterworks and Sewerage System (MWSS). The company faced several problems: it had a US$880 million debt, non-revenue water was around 60%, infrastructure was old, it was unable to provide water to one third of the households and those connected to the service had an intermittent supply of 17 hours a day on average. These problems justified the decision of president Ramos to privatize the water service in 1997 with the support of the World Bank. Following the advice of the International Finance Corporation (IFC), the WB’s private sector arm, Metropolitan Manila was divided into two areas: the east zone, ran by Manila Water Company Inc. - a joint venture between Ayala (Philippines), United Utilities (UK), International Water Limited (USA) and Mitsubishi (Japan) – and the west zone, ran by Mayniland Water Services Inc. – formed intially by Benpress (Philippines) and Ondeo Water, a Suez subsidiary (France), and nowadays also by the Philippine Government -. Perhaps the most worrisome feature of the privatization design was that it defined the water corporations as “contractors,” not public utilities in their own right. This means that the only obligations that can be enforced are contractual, and those only by the so-called “parties” to the contract. It also exempts Manila Water and Maynilad from being regulated as public utilities - for instance, exempting them from the legal maximum of 12% return on assets allowable for public utilities, as contrasted with Manila Water’s 1999 return, which exceeded 40%.12 They have also succeeded in passing their corporate income taxes on to consumers, which are prohibited for public utilities 90% of the existing debt was allocated in Mayniland and the reaming 10% in Manila Water. Consequently the performance of each concessionary has been disparate over the years. 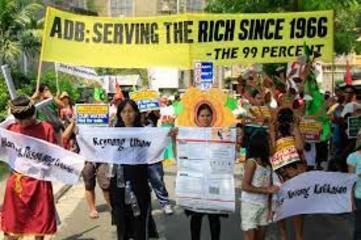 While the WB has presented Manila Water as a successful case of privatization, in 2006 Mayniland sold 84% of the company to the government shifting its debt into the public authority in an almost complete re-nationalization. Due in part to the devaluation of the Peso that doubled the value of the debt within a couple of months after privatization, concessionaires demanded an extraordinary price adjustment within two years, changing the agreements in the initial contact, which allowed them to shift losses directly to consumers. Since then, water prices have soared, with increases between 450% - 850% for residents of each zone (Many different calculations have been used to quantify the tariff increases, although all agree the raise has been over 300%. The 450% - 850% statistic is sourced from the official Resolution taken by the Philippine legislature in July, 2010). Hundreds of communities remain waterless with the high price of water pipe connections beyond reach for many. Quality has also suffered with severe health consequences; in one October 2003 case, 600 residents were sickened, and eight died when Maynilad’s E. Coli level exceeded seven times the national limit . The much-needed infrastructure investment which was used to justify the privatization has failed to materialize . As a result, water users began to protest against water privatization through different local organizations as Water for the People Network, Freedom from Debt Coalition, Bantay-Tubig (Water Watch), community People’s Organization (POs) or the fisherfolk alliance Pamalakaya. The principal claims stress out that poor citizens, specially informal settlers that have to rely on more expensive water vendors , have no access to connections, with 55% of the households lacking service in 2010. They pointed out as well that wealthier consumers, tourists and commercial establishments have a preferential access to water. Concessionaires have connected poor communities under special and well-publicized campaigns: however, these are being successful through the implication of local POs or cooperatives, that have been acting as sub-contractors at community level with no governmental control. Project Details Metropolitan Manila has been divided in two separated managerial areas: the east zone covers 8 cities, parts of 2 cities and 12 municipalities, while west zone covers 8 cities, parts of 2 cities and 7 municipalities. In 1997 the World Bank designed a bidding process to choose the concessionaires for a period of 25 years. East zone was won by Manila Water Company Inc., initially a joint venture between Ayala Corporation, United Utilities, International Water Limited and Mitsubishi Corporation. Since 2002, IFC took a financial stake investing in the concessionary, perceive for many as a conflict of interest for a development bank as the WB. Two years after privatization, Manila Water was already a profitable company. In 2010, it was given a 15-year contact extension with no competitive biding. West zone was won by Maynilad Water Services Inc., initially a joint venture between Benpress holdings Corporation and Suez. Due to financial problems, in 2006 Mayniland sold 84% of the company to the Philippine Government shifting its debt burden onto the public, in what is has been interpreted as a renationalization, and then re-privatized later in the same year. Relevant government actors Metropolitan Waterworks and Sewerage Systems (public entity). Why? Explain briefly. Privatization of water and sanitation services have worsened the living condition of inhabitants of Manila.